The “eco compact” is designed to maximize on-site solar consumption in markets where net metering is getting phased out. The German battery company Sonnen is preparing for a world without net metering. Today, the company released a new home battery product designed to maximize on-site energy use. It also comes at a price point 40 percent below Sonnen’s existing residential energy storage system. "We expect to see a dramatic increase in the installation of storage across the country," said Boris von Bormann, CEO of Sonnen, Inc., in a statement. The eco compact is outfitted with Sonnen’s self-learning software to provide various grid-tied functions, including increased household solar consumption, the ability to manage time-of-use rates, and supporting ancillary services. However, unlike the eco protect -- the home battery that Sonnen currently offers -- the compact system does not include off-grid functionality. Sonnen was able to cut the cost by removing the backup power features, and by leveraging the company’s scale and engineering experience from having deployed more than 12,000 residential systems to date. The fully integrated 4-kilowatt-hour eco compact system retails for $5,950 plus installation, which can range from an additional $500 to $3,000, depending on the customer. The lithium-iron-phosphate battery comes equipped with an inverter and Sonnen’s smart energy manager, as well as a warranty for up to 10,000 cycles. 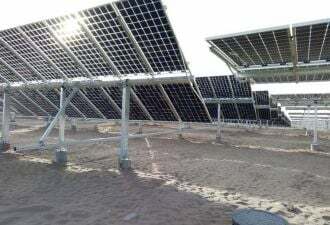 In addition, the modular design allows the compact system to be easily expanded in 4-kilowatt-hour increments, up to 16 kilowatt-hours in a single unit. Because of the outage risk from storms, earthquakes and technical grid issues, von Bormann believes there will always be demand for batteries that provide backup power. But the case for self-consumption is growing. Just last month, Maui Electric Co. announced that customers have hit the cap for the number of rooftop solar systems that can send excess power to the grid under Hawaii’s new rate structure. Going forward, customers will have to connect under the self-supply tariff, which should encourage customers to buy battery systems. Island locations with high electricity prices are target markets for the eco compact, said von Bormann. Sonnen is also looking at opportunities in Nevada, where regulators recently approved a phase-out of net metering, and it is also focused on Arizona, which is poised to see the net metering credit reduced and could see the introduction of universal demand charges. Von Bormann said Sonnen is already in contact with Arizona Public Service and is looking for opportunities to participate in the utility’s distributed energy innovation pilots. In California, San Diego Gas & Electric recently became the state’s first utility to meet its net metering cap, and thus will move to NEM 2.0 where PV customers will continue to receive a net metering credit, but must transition to time-of-use rates. Adding in California’s self-generation incentive program, which is about to relaunch with a 15 percent carve-out for residential systems, “the value proposition becomes highly, highly attractive,” von Bormann said. Sonnen doesn’t support or oppose any particular solar-related policy -- be it net metering changes or demand charges, he added. He believes it’s important to continue supporting solar as much as possible in order to drive down cost, but it’s also important to consider that storage can provide an unparalleled value stack when combined with solar and other services. Sonnen’s new $5,950 battery brings more competition to the home energy storage space. The biggest selling point for Tesla’s 6.4-kilowatt-hour Powerwall is its $3,000 price tag. However, a detailed Powerwall pricing analysis by SolarQuotes found the end-user price in Australia to be AUD $8,000 (US$6,175) -- roughly double the original estimates. In March, Tesla confirmed it had discontinued its 10-kilowatt-hour backup power battery, choosing instead to focus on the smaller battery designed for daily cycling applications. Sonnen’s eco compact has similar functionality and is now cost-competitive with the Powerwall at the $6,000 price point. Sonnen also continues to offer the eco protect, a robust residential battery with off-grid capabilities, in addition to enabling solar self-consumption and load shifting. The eco retails for $10,000. Drawing exact comparisons between battery products is difficult. For one thing, Sonnen’s eco batteries are priced as 4-kilowatt-hour packs, which are smaller than Tesla’s 6.4-kilowatt-hour Powerwall. The batteries also have slightly different life cycles. Sonnen offers a warranty for 10 years, or 10,000 cycles with 100 percent depth of discharge and 70 percent capacity (equal to 2.8 kilowatt-hours) remaining at the end of the term. Tesla’s Powerwall warranty lasts for 10 years, or 5,000 cycles, with a step-down scheme. The manufacturer’s warranty in Australia (which is no longer available online) reveals that the policy covers 740 cycles or 85 percent of 6.4 kilowatt-hours (equal to 5.4 kilowatt-hours) of capacity for the first two years -- whichever comes first. Then it covers 4.6 kilowatt-hours for three years or 1,087 cycles. And finally, it covers 3.8 kilowatt-hours or 60 percent for five years or 2,368 cycles. 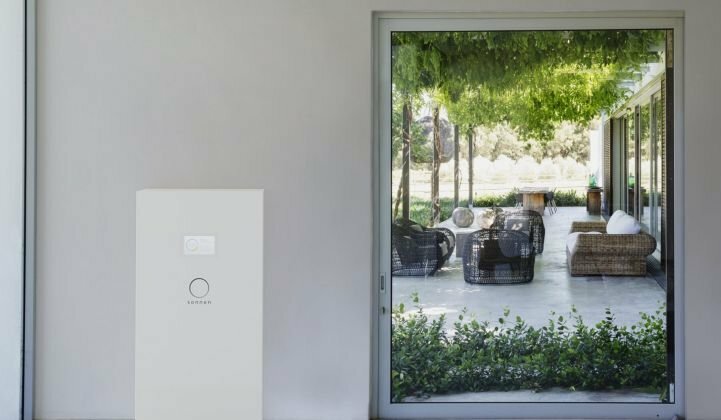 "The $6,000 price point for Sonnen's 4 kilowatt-hour system not including installation (or roughly ~$1,500/kWh, sans installation) is competitive with other offerings in the U.S. residential market today when taking into account the fact that Sonnen's new system is warrantied for 10,000 cycles, which is greater than the cycle life warrantied by some of their competitors," said Brett Simon, energy storage analyst at GTM Research. The eco compact will help Sonnen meet its goal to sell at least 10,000 batteries this year. The new product is now available for preorder, with shipments expected by the end of the year. As of today, both of Sonnen’s eco products are certified for outdoor use. The company also launched an automated web app (on display next week at Intersolar) to facilitate the sales process by helping installers design solar systems coupled with energy storage.